Léogâne is the birthplace of the Taíno queen Anacaona (the town was originally called the Amerindian name Yaguana) as well as Marie-Claire Heureuse Félicité, the wife of the Haitian revolutionary Jean-Jacques Dessalines (1758). It was founded by the French in 1711. Charlemagne Péralte, the leader of the Haitian resistance to the U.S. occupation that had started in 1915, had been a military officer stationed in Léogâne. He resigned from the military, refusing to surrender to the U.S. troops without a fight. Afterwards he returned to his native town of Hinche and began leading the Cacos against the occupation forces. Since 2005 (before the 12 January 2010 earthquake) the city has had an Episcopalian nursing school, Faculté des Sciences Infirmières de l'Université Épiscopale d'Haïti à Léogâne. There was also a hospital run by the Episcopalian Diocese, with Presbyterian missionary collaboration; Hopital Sainte-Croix (Holy Cross). The hospital had closed to inpatients two years previously, and although it had continued with a variety of outpatient services, it is since restored to a being full service healthcare institution. The centerpiece of the city was the now-destroyed Roman Catholic Sainte Rose de Lima Church. A new Catholic school, "Notre Dame des Anges", run by the Jesuits (the Society of Jesus), and made possible by money sent from the Vatican, will be dedicated by Catholic and government officials on Thursday, 27 November 2014, about five years after the 12 January 2010 earthquake. Wikimedia Commons has media related to Léogâne in 2010. A LCU from the 22nd MEU delivers humanitarian aid and supplies to the beach at Léogâne. Léogâne was at the epicenter of the 7.0 magnitude 12 January 2010 earthquake, and a United Nations assessment team that investigated three main towns near Port-au-Prince found that Léogâne was "the worst affected area" with 80 to 90% of buildings damaged and no remaining government infrastructure. Nearly every concrete structure was destroyed. The damage was also reported to be worse than the capital. The military estimated that 20,000 to 30,000 people had died from the earthquake in Léogâne. People had congregated in ad hoc squatter camps and relief had taken longer to reach Léogâne. In the wake of the temblor destroying municipal buildings, city hall was moved to a telecommunications building. Among the facilities destroyed in the quake was the Sainte Rose de Lima School, considered the emotional heart of the city. The main commercial strip, the "Grand Rue" was also collapsed. Saint Croix Hospital was also partially demolished. The "court of the peace" building was destroyed in the temblor. British urban search and rescue teams with Rapid-UK along with the Icelandic search and rescue team were the first to reach the destroyed town on 17 January 2010. The Canadian destroyer HMCS Athabaskan first reached the area on Tuesday, 19 January. The Athabaskan's crew of 280 have been tasked to supply humanitarian aid to the city and assist in relief efforts. A Japanese field hospital, Sri Lankan peacekeeper unit, and an Argentine White Helmets field hospital are already in the field treating survivors, the Japanese and Argentinians had arrived on the 18th. The Canadian Medical Assistance Team (CMAT) arrived on the 19th, and set to work performing surgeries. The missionaries of World Wide Village, set up outpatient clinics beside the Japanese Red Cross at the nursing school in Léogâne within days after the earthquake. Volunteer medical personal together with teams of volunteer surgeons from World Wide Village and the University of Notre Dame, have seen and treated thousands of patients. World Wide Village brought in a Field Hospital which began full operation in Late February 2010, the new, "Hospital St. Croix". World Wide Village and the University of Notre Dame continue to send teams to the nursing school/field hospital to meet ongoing health care needs in Léogâne. The NGOs Heart to Heart International and Médecins Sans Frontières were providing medical aid at clinical sites in the area. As Léogâne has no airport, the Canadians began using the small strip at Jacmel to avoid the bottleneck in Port-au-Prince, and had 250–300 personnel there the next day. The Canadian 1 Field Hospital is being deployed to Léogâne. The Cuban military set up a field hospital in the region. Canadian soldiers are providing security for food distribution points. The Canadian medical facility is located near the Japanese field hospital, which is next to the nursing school, which has been turned into a hospital. Canada has deployed the Van Doos, a Canadian infantry regiment, to help with recovery efforts. Haitian Girl Guides and Boy Scouts are providing crowd control at some food distribution points. With no airport in Léogâne, any aid needing to be airlifted in needs to be carried by helicopter, or through use of small planes on makeshift landing strips. The highway, Route 9, at Léogâne, was cordoned off by UN Peacekeepers to use as such a landing strip. The Korean government announced it would deploy 250 peacekeepers to the region in February, composed mostly of engineers, with some medical troops, and marines for security. The mission comprises 120 military engineers, 22 medics and a 1,200 tonne-freighter filled with supplies and equipment. As of 18 February 2010, the Korean Peacekeepers had started work on building a hospital. On 27 February 2010, 190 South Korean Peacekeepers left home for deployment in Léogâne. By 28 February 2010, 240 members of South Korean Peacekeepers (Task Force Danbi / Operation Danbi) had arrived. The UN Food and Agriculture Organization started a cash-for-work programme to clear irrigation canals in the Léogâne area. As of 9 February 2010, the US 24th Marine Expeditionary Unit was rotating out of Haiti, having been replaced by the US 22nd Marine Expeditionary Unit, in their position on USS Bataan and Carrefour, Léogâne, Petit-Goâve, and Grand-Goâve. On 2 March 2010, the IFRC decongested a refugee camp, creating a second one out of the overflow. Once the victims of the earthquake were cared for, 1 Canadian Field Hospital began to treat patients with other serious illnesses. Many operations were performed on patients who traveled long distances to Léogâne for care. On 7 March 2010, it was announced that HMCS Athabaskan was to end its mission on 10 March. The economy in Léogâne remains predominantly an agricultural based economy, despite the challenges that are facing the agricultural sector in the commune of Léogâne. Agriculture constitutes a key sector to economic growth for the commune of Léogâne. The sugarcane industry holds the largest share in the economy, especially with the re-opening of the sugar mill "Jean Léopold Dominique" in Darbonne. Sugar Mill in Darbonne Léogâne. This sugar mill produces surplus cane molasses which some of it are used to aliment the smaller distilleries around the commune. The Jean Léopold Dominique sugar mill in Darbonne has the capacity of producing 375,000 metric tons of sugar; it also has the output capacity of 22 megawatts (MW) of electricity. The sugarcane industry is closely followed by the banana industry and then grains such as maize, sorghum and rice. Legumes and foodstuffs such as sweet potatoes, cassava, beans, and yams complete this chain. A significant amount of fishing and farming is practiced throughout the coastal areas. Aviculture and apiculture farms have been rapidly expanding in recent years. Coffee is a crop of vital importance to the entire national economy. It is one of the major cash crops for Léogâne's peasants living in the humid mountain areas considered strategic for the country ecologically. Nearly 200,000 households at the national level is still engaged in this culture at least 20% of their annual income derived from coffee, allowing them to obtain cash income for supporting the family expenses such as: education children, family health and also certain investments such as the construction of residential houses, buying cattle. Tombe Gateau Léogâne is home to the largest coffee mill in Haiti which covers the Southeast region, Center, Artibonite and Grande-Anse. The Federation of Native Coffee Associations (FACN), is the owner of the trademark Haitian Bleu, a blend of coffee. Next to agriculture, building materials are playing an important role in the local economy. Building materials are standing in fierce competition with the agricultural sector. In fact, construction enterprises are emerging at such an alarming rate that many territories that were once occupied by crops are now restricted to concrete. Two other sub-sectors are occupying a statistically relevant role in the economy; transportation and private schools. Proximity to the metropolitan area of Port-au-Prince is also of economic significance to Léogâne. It constitutes a market exceeding two million potential customers, excluding the five-hundred thousand people living in the palm regions. The labor force constitutes another productive factor available in sufficient quantity in Léogâne. The region consists of a population of more than 55% young adults who are willing and able to work. Léogâne has the capacity of putting in the labor market nearly 100,000 active farmers, excluding prospective workers coming from neighboring municipalities. Léogâne has many tourist attractions with the renovation of historical sites such as Fort Campan, Latounèl Gwoso and one of the most ancient windmill in the western hemisphere located in Baussan. The best way to explore the exotic flora and fauna in Léogâne is on foot. Ayiti (Haiti), which was the native name given to the entire island of Hispaniola to mean, "Land of high mountains", has many mountains. Ten of the thirteen communal sections of Léogâne are located in the mountains which covers more than 25,000 acres of mountainous region. Hiking is quite a popular activity in Léogâne among visitors. With the success of Mountain Bike Ayiti (MTB Ayiti) an event hosted by the Léogâne Cycling Club (LCC) in 2013, Léogâne has become a location adventure tourism. Léogâne is also a home to thousands of local plants and natural species. The rehabilitation of natural grottoes such as the grotto Belloc, Anacaona, and Fond d'Oie can offer visitors a unique experience in Léogâne. Each year thousands of people from all over the country make religious pilgrimages to Léogâne to visit the many patron Saints in the area. From Saint Dominique to Saint André, Thérèse, Antoine, Gérard, Philogène, and Sainte Rose these are cultural factors that appeal greatly to tourists, no other place in Haiti houses more religious pilgrimages sites than Léogâne. In addition, Léogâne has twenty-five kilometers of sandy beaches. Léogâne is the host location for several annual events, which attracts national and international visitors to the city each year, distinctly Rara and Fête Champêtre. The boisterous Rara festivals take place during lent, Rara season is Léogâne’s most prideful and joyous event of the year. Léogâne is the bastion of Rara, a rural festival that quickly emerge as the most popular cultural of Haitian heritage. The phenomenon of Rara is at once a season, a festival, a genre of music, a religious ritual, a form of dance, and sometimes a technique of political protest. Rara season starts along with Carnival, and keeps going through Lent, culminating on Easter week. Local Rara societies form musical parading bands that walk for miles through local territory, attracting fans and singing old and new songs. Rara is a paradoxical mix of both carnival and religion. Rara bands often stop at crossroads, the homes of community leaders and important religious spots—cemeteries for example, where they salute their ancestors. Musicians play drums, sing, and sound bamboo horns and tin trumpets. The typical Rara orchestra consists of drums followed by bamboo instruments called bamboo or vaccine, some metal horns called konet, and then several waves of percussion players with small, hand-held instruments like the maraca, and finally a chorus of singers. Also there is usually a core group of performers either Major John (Majò Jon), the whip holding Colonel (Kolonèl), Kings and Queens (Wa ak Rènn) who dance for recognition. Rara has evolved throughout time to include wind instruments such as the helicon, the trumpet, saxophone, etc. Each player plays one note, in a technique called hocket, and together the band comes up with a melody. To help their timing, the vaccine players beat a kata part on the bamboo with a long stick, making the instrument both melodic and percussive. Then, a chorus of fanatics sing and dance along to the music. The sound carries for miles around, and lets fans know that the Rara parade is coming. The town of Léogâne is best known for its Rara, but the festival is practiced all over Haiti, and is different from region to region. The genre was imported to the Dominican Republic and is now an integral part of the Afro-Dominican music scene, where it is known colloquially as Gagá. This is an old festival, dating back to colonial times. The genre though predominantly Afro-based has some Taino Amerindian elements to it such as the use of güiros and maracas. Its songs and melodies have been passed down for generations, so they are all popular "hit" songs. And Rara is played enthusiastically in the summertime, in major cities throughout North America: In Miami, New York City, Havana, Boston, and Montreal. For many Haitians in the Diaspora, playing or dancing Rara delivers the special ambience of Haiti. It is a taste of home. Rara has evolved into an important contributor to the local economy. Rara season stimulate commercial activity and are significant generators of revenue within key sectors of the economy, particularly cultural industries, tourism and hospitality. Rara season attract positive media attention, and provide the basis upon which strong destination branding can be built. Above all, Rara season draw overwhelming numbers of visitors to Léogâne at specific times of the year. The net result has been the growth of rara-driven festival tourism that has created an alternative and sustainable source of tourist revenue for the city. Léogâne is well known for being a city of sport. It is home to five major league sports teams: the Léogâne Cycling Club (LCC), Cavaly Association Sportive Club (CASPORT), League Basketball Léogânaise (LBL), the Valencia Football Club (VFC), and the Anacaona Football Club (AFC). Léogâne Cycling Club (LCC), is a cycling club that came into being on 15 December 2002 in the palms region, more precisely in Léogâne, following a race that was organized in the region which many of the participating cyclists weren't members of any particular club at the time. These athletes from all walks of life joined together to form the Léogâne Cycling Club and had elected Jonas Ronald as the club's President. In 2013, the Léogâne Cycling Club and Mountain Bike Ayiti hosted together the first-ever International mountain bike competition in Haiti. Cavaly Association Sportive Club (CASPORT), is a Haitian professional soccer club based in Léogâne, Haiti. Founded 10 May 1975 in Léogâne this club has represented Haiti in the Concacaf Competitions of Clubs in 2009, and several of its former players have secured professional contracts in Asia, Europe, Latin America and the United States. Valencia Football Club (VFC), is a Haitian professional soccer club located in Léogâne, Haiti. The club plays in Haiti's top national league, the Ligue Haïtienne. Valencia FC was founded on 27 June 1972. The club won its first national championship in 2012 and several of its former players have secured professional contracts in Asia, Europe, Latin America and the United States. 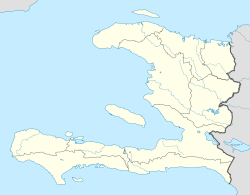 Léogâne is bounded to the north by the gulf of Gonâve, to the east by the commune of Gressier, to the south by the summit of the "Massif de la Selle" which separates it from the south-east (Jacmel), and to the west by the commune of Grand-Goâve. Léogâne is a community with widely diverse microclimates. The average temperature in Léogâne is considered by many to be warm. It stays approximately the same throughout the year in terms of degrees. Temperatures are almost always high in the lowland areas, ranging from 15 °C to 25 °C in the winter and from 25 °C to 30 °C during the summer. The lowland portion is relatively warm throughout the year; the dry mountains with moderate temperatures; the humid mountainous areas with very mild temperatures and humidity fairly high all year round. The annual rainfall in the commune of Léogâne is between 800 millimeters to 1277 millimeters of rain. The dry mountains in Léogâne are those receiving less than 800 millimeters of rain annually. The following communal sections are categorized in this group: Fond de Boudin, Palmiste à Vin, Gros Morne, Cormiers, Petit-Harpon and Citronnier. The humid mountains in Léogâne received more than 800 millimeters of rainfall yearly. In this group are categorized the following communal sections: Orangers, Aux-Parques, Beauséjour, and Fond d’Oie. In regards to the availability of water, the commune of Léogâne has six rivers (Rouyonne, Momance, Cormier, Ravine Seche, Haut-Saut and Courbyon), nineteen streams, two ponds and a lagoon. Despite the abundance of water in the region only three communal sections are irrigable; Dessources, Petite-Rivière and Grande-Rivière. These sections are crossed by several rivers and streams, some more important than others. The Momance River in Grande-Rivière, for example, is the most significant river in Léogâne, because it is widely used for irrigation purposes. This river also has the potential to generate renewable energy via hydro-electricity. Anacaona, Queen Anacaona (from Taíno anacaona, meaning "golden flower"; from ana, meaning "flower", and caona, meaning "gold, golden") was a Taíno cacica (chief), sister of Bohechío, chief of Xaragua. Anacaona was born in Yaguana (today the town of Léogâne, Haiti) in 1474. Marie-Claire Heureuse Félicité, Empress of Haiti (1804–1806), the wife of Haitian Emperor Jean-Jacques Dessalines. She was born in Léogâne the daughter of Guillaume Bonheur and Marie-Élisabeth Sainte-Lobelot. Joseph Balthazar Inginac better known as Balthazar Inginac was a Haitian general. He served as personal secretary for President Alexandre Petion and Jean-Pierre Boyer of Haiti. Simone Duvalier, Simone Ovide Duvalier (c. 1913 – 1997), was the wife of Haitian President François "Papa Doc" Duvalier (1907–1971), and the mother of Haitian President Jean-Claude "Baby Doc" Duvalier. She was born Simone Ovide in 1913 in Orangers, Léogâne the daughter of a mulatto merchant and writer Jules Faine and Célie Ovide. Coupé Cloué Jean Gesner Henry, (10 May 1925 – 29 January 1998), popularly known as Coupé Cloué, was a Haïtian footballer, singer, guitarist, and bandleader. He was born in Tombe Gateau, Léogâne. Jean-Claude Duvalier nicknamed "Bébé Doc" or "Baby Doc" (3 July 1951 – 4 October 2014), was the 41st President of Haiti from 1971–1986. He was born in Port-au-Prince his family (mother), Simone Ovide Duvalier was from Orangers, Léogâne. Edwidge Danticat born 19 January 1969), is a Haitian-American author. She was born in Port-au-Prince to a family originated from Mathieu, Léogâne. Pascal Millien born 3 May 1986), is a Haitian professional footballer who currently plays for Sligo Rovers F.C. Pierre Garçon born 8 August 1986), is a Haitian-American football wide receiver (WR) of the National Football League. Pierre Garçon is of Haitian descent his family is from Petite-Rivière, Léogâne. Ricardo Pierre-Louis born 2 November 1984), is a Haitian professional soccer player who played for the Cape Cod Crusaders in the USL Premier Development League. Johanniter International (Built top of the bill rehabilitation center in Leogane, which was donated to the Seventh Day Adventist Hospital) and six community clinics in the region of Leogane. They also trained more than 30,000 villagers in disaster reduction and preparation. Deep Springs International (sponsor of Gadyen Dlo) and the Children's Nutrition Program are based in Léogâne. The University of Notre Dame du Lac of Indiana is hosted by the Sainte Croix Hospital, and with the U.S. Centers for Disease Control and Prevention, assists the hospital in conducting a Ministry of Health-sanctioned reference center to research, treat and control the mosquito-borne disease lymphatic filariasis (also known as elephantiasis). GOALS (Global Outreach and Love of Soccer) is a permanent sport-for-development organization in Léogâne which uses soccer to mobilize youth to improve health, the environment and local leadership. La Faculté des Sciences Infirmières de l'Université Épiscopale d'Haïti à Léogâne (FSIL) is a baccalaureate nursing school located in Léogâne. Éditions Ruptures (Association Éditoriale Ruptures) is a pioneer editorial and publishing institution in Haiti established in 2009,in Léogâne. Initially, it aimed at helping young and disenfranchised writers to publish their work at a time when publishing and editorial services were luxury in Haiti. It championnes the idea of creating a Haitian-based publishing house that prioritizes Haitian writers – not just the bourgeois. In 2016, it established the Josaphat Robert Large Cultural Center in an attempt to extend our outreach to a broader constituency to provide cultural and educational services. ^ "Léogâne Mayor Santos Alexis". bbc.com. BBC NEWS. Retrieved 12 July 2010. ^ a b c Lisa Millar (17 January 2010). "Tens of thousands neglected at quake epicenter". ABC News. Agence France Presse. Retrieved 17 January 2010. ^ O'Loughlin, Karen Fay; Lander, James F. (2003). Caribbean Tsunamis: A 500-Year History from 1498–1998. Springer. pp. 85–86. ISBN 978-1-4020-1717-9. ^ "A hospital for Léogâne". Medical Benevolence Foundation. Presbyterian Haiti Response Team. Retrieved 10 January 2012. ^ a b Daphne Benoit (26 January 2010). "Out of the chaos, Haitian town gets new hospital". Sinchew. AFP. Retrieved 26 January 2010. ^ "Dans son malheur, la ville haïtienne de Léogâne a au moins gagné un hôpital" (in French). Romandie. AFP. 25 January 2010. Retrieved 26 January 2010. ^ a b c Scott Wilson (19 January 2010). "In Leogane, Haiti, rebuilding starts with scavenging". Washington Post. Retrieved 26 January 2010. ^ "Community Planning Workshop Report". haiti.nd.edu. Retrieved 15 March 2011. ^ "Haiti Earthquake Fast Facts". CNN Library. © 2015 Cable News Network. Retrieved 6 January 2015. ^ a b Patrick Solomon (27 January 2010). "It's the Haitians who Will Rebuild Their Country". Huffington Post. Retrieved 28 January 2010. ^ "Haiti quake victims' bodies 'piled up by roads'". BBC News. 18 January 2010. ^ Stephen Maher (20 January 2010). "'We dead already'". The Chronicle Herald. Archived from the original on 24 January 2010. Retrieved 25 January 2010. ^ Alexander Panetta (26 January 2010). "Group of Canadian volunteers in Haiti struggles to save one life at a time". Canadian Press. Retrieved 26 January 2010. ^ Shari Balga (19 January 2010). "Canadian Medical Assistance Teams arrive in Leogane, Haiti" (Press release). Canadian Medical Assistance Teams. Archived from the original on 17 January 2010. Retrieved 26 January 2010. ^ "University of Notre Dame" (plos.org). By: Dunstan Mukoko, Ministry of Health, Kenya. Internet Systems Consortium © 2015 Haiti Program. Retrieved 17 July 2014. ^ Gloria Galloway (20 January 2010). "Canada's big task in Haiti starts on small airstrip". The Globe and Mail. ^ Sean Chase (22 January 2010). "Mobile hospital ready to deploy to Haiti". Toronto Sun. Retrieved 26 January 2010. ^ a b Talbot M, Meunier B, Trottier V, et al. (August 2012). "1 Canadian Field Hospital in Haiti: surgical experience in earthquake relief" (PDF). Can J Surg. 55 (4): 271–4. doi:10.1503/cjs.001411. PMC 3404149. PMID 22854149. ^ "Des soldats de Valcartier prêtent main forte" (in French). LCN. Quebecor Media. 23 January 2010. Retrieved 26 January 2010. ^ Shaila Dewan (4 February 2010). "Volunteers Fly Supplies Into Hard-to-Reach Areas". New York Times. Retrieved 4 February 2010. ^ Lee Min-yong (6 February 2010). "Korea set to send PKO to quake-torn Haiti in Feb". Joong Ang Daily. Retrieved 6 February 2010. ^ Hayney (9 February 2010). "Advance group of PKO heads to Haiti following parliamentary approval". Yonghap News. Retrieved 9 February 2010. ^ "Reconstruction Unit". The Dong-A Ilbo. 18 February 2010. Retrieved 23 February 2010. ^ "190 Korean Peacekeeping Troops Leave for Haiti". Arirang. 27 February 2010. Retrieved 6 March 2010. ^ "Korean peacekeepers arrive in Haiti". Korea Herald. 8 March 2010. Retrieved 12 March 2010. ^ "FAO Clears Blocked Irrigation Canals in Earthquake-Hit Leogane". Nam News Network. 9 February 2010. Archived from the original on 19 July 2011. Retrieved 9 February 2010. ^ "24th Marine Expeditionary Unit Leaving Haiti". NBC News. WITN. 9 February 2010. Archived from the original on 18 July 2011. Retrieved 10 February 2010. ^ Alex Wynter (3 March 2010). "IFRC 'decongests' Haiti camp". Reuters. Retrieved 6 March 2010. ^ Christina Spencer (7 March 2010). "Canadian troops preparing to leave Haiti". Toronto Sun. Retrieved 9 March 2010. ^ Jessica Leeder (8 March 2010). "Haiti will not be 'left behind,' MacKay says". The Globe and Mail. Retrieved 9 March 2010. ^ "Haitian worker at the Jean Leopold Dominique de Darbonne sugar factory". © Townhall.com. QUAKE-HAITI/FOOD. Retrieved 25 March 2010. ^ "Federation of Native Coffee Associations (FACN)". rombouts.co.uk. Retrieved 28 January 2015. ^ "MTB Ayiti". mtbayiti.org. Retrieved 29 January 2015. ^ "Fêtes Champêtres". lematinhaiti.com. NEWS. Retrieved 26 August 2011. ^ "Rara Festival 2013 in Léogâne". haitilibre.com. Haiti news; the haitian people's voice. Retrieved 28 January 2015. Wikimedia Commons has media related to Léogâne.